Here in this article, I’m going to address what happens when the footjoint has the opposite problem. It’s actually frozen on. I mean, completely stuck. Not movable at all. Sometimes a footjoint can be accidentally “cross-threaded”. I know it doesn’t look like there are threads on there, but there are. Believe me. BTW, if this hasn’t happened to you. Be glad. Very glad. It takes a good repairman to get it apart without breaking the flute. I’ve had a couple of sad students who took their flutes to their dads, who then got the pliers (!) out and worked on it themselves. Bad move. Both flutes were ruined. One was a brand spankin’ new $4,000. flute. Yikes! I believe in both cases above, a small piece of dirt or lint from the flute case was caught between the joints when the students were putting them together. Because the joints are supposed to be completely airtight, it just made it impossible to get off. Clean your flutes, friends. A lot. Please, if this happens to you. Do not take the pliers to your flute. Read the following carefully and see what really needs to happen. NOTE: ***I am going to add a video to this page demonstrating how to properly take on and off your footjoint, and what to do if you find it stuck. The following is a really confusing email I received from a very famous flute technician in New York. Read it if you dare. First: here are instructions about removing a stuck footjoint. 1. Every single time that you put your flute together, take the microfiber cloth and carefully wipe the tenons. Those are the pieces that fit inside the other pieces the headjoint tenon fits into the barrel of the body, and the footjoint tenon at the end of the body fits into the receiving box on the footjoint itself. Take your fingernail and press the microfiber cloth up against the ring that separates the body from the footjoint tenon. You want to wipe off any dirt or solder that might scratch the receiving box. The footjoint tenon should always look completely clean and shiny. Then also wipe inside the receiving box on the footjoint. It’s harder to see in there, but you want to wipe it as firmly and carefully as possible to also remove any dirt or loose solder. 2. When you put the footjoint on the flute, you will try to do the opposite of the steps I’m about to give you for taking the footjoint off. It’s just easier to describe the steps to take it off first. a. Hold the body of the flute just above the rods (and keys) below the barrel where the name of the company appears. The goal is to have your two hands as close together as possible. Your left hand will be palm up with your fingers curled around the body of the flute. b. Hold the footjoint with your thumb either on the actual E-flat key or on the body of the footjoint. The palm of your hand will lie over the rod that holds the rest of the footjoint keys. Your fingers will extend over past the rod and keys. Your right palm will obviously be facing down (just like you play the flute). d. I have seen Jeff take footjoints off by simply holding the footjoint with his thumb and his index finger. I can’t really do that. I use the heel of my hand (below your knuckles) to push against the rod a little bit. When you push gently with the weight of your hand distributed across the whole rod, you won’t damage the rod. However, it’s important to use the leverage in your left hand turning inwards as well as using your right shoulder and arm to pull the footjoint away at the same time. When you have all of that leverage coming from all of those directions, the pressure you’ll put on the rod will be so slight that there’s no way you can hurt the keys. It’s just enough to give it a little bit of extra push. e. When putting the footjoint back on the flute, just make sure that you have the footjoint lined up exactly with the body. Don’t come at an angle or you might dent the tenon. Remember that your two hands should always move in opposite directions and both hands need to move at the same time. Don’t just move your right hand. You need the extra leverage coming from your left hand. I usually line the rod of the footjoint up with the rod of the body and then twist on. 3. A lot of teachers tell you not to touch the keys or rod of the footjoint. The problem with that is that if you hold the footjoint down at the very end of the flute, you have very little strength and leverage. You are also putting a flexing and downward-bending pressure on the footjoint. If you are cleaning your footjoint tenon and if you are using the right leverage and twisting motion, you will not harm the footjoint keys by holding them. 5. 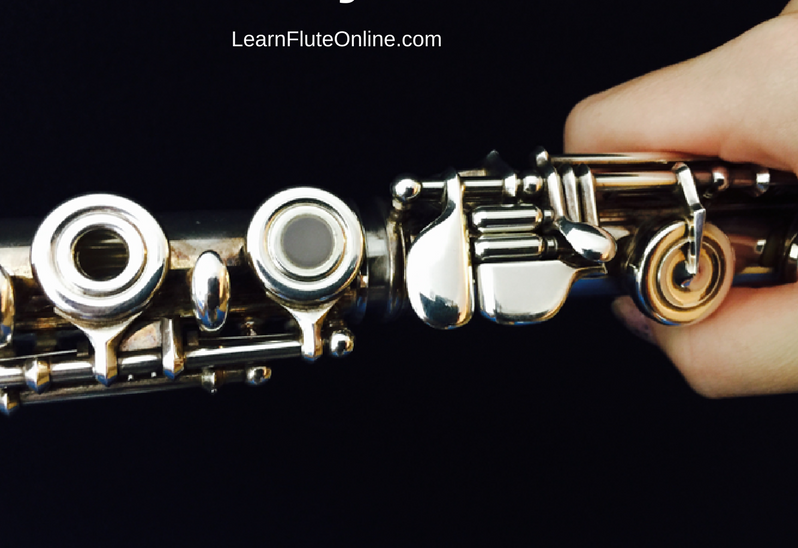 All of this might sound complicated, but once you practice doing it this way, you will become very skilled and very fast at taking the footjoint off this way. Right hand index finger will lie on the E-flat key (not the thumb!!). The thumb is on the tube of the footjoint near the left ring of the footjoint. Watch for a video from me (Rebecca) to be added to this article. I will try not to be as confusing as the information above. This is important! If you have a question comment down below, I always answer. *If you haven’t yet signed up for my newsletter and 700+ video flute lessons, please do so now. You won’t be sorry! hi, i recently rented a flute from school. recently, i’ve been trying to practice but the headjoint wouldn’t twist on all the way. now, it won’t twist off. is it just that i didn’t clean well enough or is there an issue???? Glad you’re doing well learning, Jamie. Those ‘double notes on one’ are probably eighth notes? They’re fun! I’m a little better at it now but now we’re learning a song and it has like double notes on one!! How what are they called? As I was practicing my flute…sadly the foot joint got stuck to the body joint!!!!! My mom and I tried doing anything we could think of after searching it up on the Internet it still wouldn’t budge at all!!! What shouldo I do?! Oh Whew. I’ve been wondering if you fixed it. Good job! Hey. I had that happen, but after a while of twisting it a little, I eventually got it off! Make sure never to set it on the floor and press down on it to “tighten it”. This could lead to bending. Help! I have a student loaned flute that I have been using for 3 months now from switching from an oboe, and I follow all guidelines, procedures, abd clean my flute almost everyday, but my foot joint still gets stuck and is almost impossible to take apart! What shall I do? This is my second year playing flute and I’ve cleaned it every day and today my flute foot joint got stuck. Like it won’t com off at all! I’ve been playing the flute for a couple months now and a while back it started getting harder to assemble. Now the foot joint is COMPLETLY stuck… I have been cleaning it regularly and i tried a lot to take it off and i don’t know what to do now. Is there anything else you can do to take it aparat? I just bought a student flute yesterday & it’s stuck. I hope you can help!